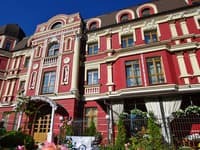 One-room business-class apartment are located near the center of Kiev, near the National Circus of Ukraine. 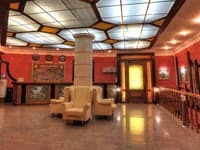 The shopping mall "Ukraina", convenience stores, banks, cafes and restaurants are situated nearby. The nearest metro station is “Universitet”. 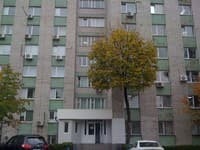 The apartment is in a modern style, with new furniture, equipped with all appliances: air conditioning, TV, washing machine, microwave, fridge, electric kettle, hair dryer, iron. All bedding and bath accessories are included. Free Wі-Fі is available. Apartment keys can be picked up directly at the apartment or at the concierge desk near the apartment at the agreed time. Distance from the Railway Station is 1.7 km, from the airport “Borispol” – 36.4 km. Description of the room: One-room studio apartment of business class with new furniture, all appliances. There is a large double bed, wardrobe, coffee table, ottoman, built-in kitchen - fully equipped with all dining and kitchen appliances. 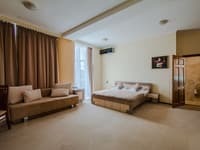 One-room business-class apartment are located near the center of Kiev, near the National Circus of Ukraine. Distance from the Railway Station is 1.7 km, from the airport “Borispol” – 36.4 km. From the railway station with a public transport stop Railway Station Central to go by shuttle bus number 558 to the Victory Square stop. Then walk to the specified address about 5 minutes.